Our Elans were built to be driven and not all of us want to to use them on Track Days. 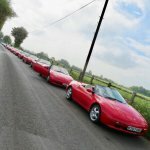 If you use, or plan to use, your Elan as a Grand Tourer and have completed or are planning some great trips then inspire the rest of us with the details. Putain, il fait chaud, il fait tres chaud, il fait tres tres chaud, il fait tres tres tres chaud! St Malo to La Tranches sur mer and then to Libourne, blue sky 29-30 degrees hood down of course. Arrived in La Tranche after excellent overnight crossing to St Malo and lovely drive. All OK with car, well not quite. The passenger window stuck and had to carefully help it closed. And I tried Lotusflasherman's brake fluid test: let the BMC run low and see if the light comes on. It does and it did! Topped up with fluid, cleaned off rogue brake fluid from rear wheel, but absolutely no sign of a leak at all. And I've now done 400 miles since, brakes fine and no wet wheels anywhere. Bit baffling as to why really. Thought maybe a cracked caliper or a faulty piston seal, but no further sign of leaking leaves me dumbfounded but relieved. Have now done over 600 miles and am in Carcassonne for a couple of nights. What a beautiful "cité": stunning mediaeval fortress - walled town. Will explore in detail tomorrow. Photos will follow too when I work it all out. This is a long road trip, I am glad you enjoy it and the Elan is (mostly) running fine! Fredjohn wrote: Putain, il fait chaud, il fait tres chaud, il fait tres tres chaud, il fait tres tres tres chaud! St Malo to La Tranches sur mer and then to Libourne, blue sky 29-30 degrees hood down of course. Glad your fluid warning light worked correctly when you needed it to. Going to check mine when I fit those DVB HiSpecs. Are your rear calipers OE or PNM/HiSpec? Was talking to Alec at HiSpec and he mentioned how easy it is to push fluid past the seal if handbrake and footbrake are used together. Envious of you in France, I'm going soon - lovely empty roads, smile for the camera (no info provided from DVLA) but travelling alone I use the Liber-t Télépéage Scheme so I can cruise through the toll booths - they've introduced 30 kph lanes so just drop to 30 kph and drive at the barrier and keep fingers crossed that it lifts. Works out a bit cheaper too... perhaps I should say 'less expensive' !! Carcassonne Citadel is a great sight floodlit at night. If you are moving on towards Nimes a minor detour into Agde might be interesting - one of the oldest towns in France founded by the Greeks in 500 B.C. so very interesting architecture but not dependent on tourists as it's the commercial centre for the surrounding area but plenty of restaurants and cafes to provide lunch for the workers. Some on boats moored on the River Herault. From Agde a run along the coast road to Sete is more fun in an Elan than the A9. Watch out for sunburn and hope your cooling is OK as Agde has the highest average temperature in France. Are you using the Millau Viaduct on the way home? Do it in the evening and you can often look onto the tops of the clouds below! Quite a sight. Phil: thanks for your comments: what a useful site this continues to be. Yes I do have PNM/HiSpec rear calipers, so I probably did put footbrake and handbrake on together at some point. I won't now !!!!!! Generally tried not to anyway as doing so prevents the auto adjust of the handbrake working (well it did on the OEM set-up, so assumed it would with the Golf Mk4 calipers of the PNM set-up). As Carcassonne to Nimes is only 125 miles, it will be a site seeing day too. Thanks for the tip to see Agde and Sete: I had bizarrely already planned to go this way! Nice bit of history too Phil. We are staying in Carcassonne for 2 nights, so today is "do the citadelle day". Will torture a few Cathars whilst here. Or maybe just have a beer and watch the world go by. On the way down we went to Rochefort and I paid another visit to the now finished replica build of L'Hermione. It has sailed to and from the States and now floats in the larger of the two 16th century dry docks in the town. After 16 years of following its construction it was fantastic to be able to go on board and see the finished article. A truly wonderful project which helped rejuvenate Rochefort and engaged millions of people. Its next voyage is in 2018 when it will do a tour of the Med. See the Herminoe website here for more info. We will return over the Millau bridge, but during daytime: I have already visited it 4 years ago: see the photo in my signature taken at the visitor centre below this wonderful (British designed) bridge. There is an unusual shot to be had when you're leaving the car park John. I snapped fractionally too early. I may be a bit late John, but if you're into boats a diversion to the harbour at Cap d'Agde might be interesting. I've seen tall ships in there from time to time but am always attracted to the massive high speed 'gin palaces'. Thanks Phil: I am into boats but they must be of the non-motorised variety. I've sailed dinghies since I was 14 and have my day-skipper theory and practical, so lots of Med based yacht flotillas and deliveries. It will nevertheless be interesting to view the harbour with a quizzical eye! We toured the cite of Carcassonne today: what a fantastic old town. Massive medieval fortifications as can be seen from afar and below. Just wandered and wandered all day round this fascinating town and soaked in the history and atmosphere. And some food and beer! Having seen the photo I'm pretty sure I saw L'Hermione in the harbour at Cap d'Agde earlier this year during their boat show. Crowds of French in the way so I didn't take a photo, which I now regret. Sète puts on a great show. Their water jousting tournaments are great fun to watch but there's obviously a lot of pride or money at stake as there is as much entertainment watching the team managers arguing with each other on shore - two almost got into fisticuffs last time we were there.. Journey continues to Nimes and Arles and the Camargue. Still scorchio: 30 degrees plus, but car happily cools down with the fans or with driving to stay within the usual parameters'. Beautiful scenery and amazing features of the Camargue coupled with very persistent mosquitoes and snotty B&B owner. Spent some time in Sainte Marie on the coast and then in Arles, followed by driving up to the Pont du Gard. Heading back to coast tomorrow to Palavas-les-flots for a bit of sun sea and sand before heading to the Perigord area. Traffic has been pretty light so far and been able to cruise easily at 75-80mph on the motorways and around 65-70 on the other roads (well = 90kph doesn't it?) Car running really well no more problems since the initial worries. Averaging about 31mpg. But I do need some decent glue for the door carpets!!!!! Final parts of the journey as we meandered our way North from the sweltering Med. coast of southern France towards the Perigord area. It decided to rain on Wednesday: all day during the 150 mile journey to near Figeac. But did have a slight break in the weather to take this photo of the wonderful (British designed) Millau Bridge. Car was still running well apart from a vibration between 50 and 70mph. It disappeared at 75-80mph on autoroute, so stuck at that speed. Felt like wheels out of balance: job on return. We also spotted this rather nice British AC Greyhound at a service station just south of Millau. It was heading to Gerona. One of only about 80-90 built, beautiful restoration had been done except someone in the past had taken out the Bristol engine to put in an AC Ace, so this one was powered by the ubiquitous Rover V8. Wonderful growly sound. After an overnight stop we continued up to the St Jacques de Compistello pilgrim route town of Rocamadour. Just a quick coffee stop and no tourist visit today, although the weather was much better. An amazing place well worth a visit: it clings to the side of a cliff with lots of mediaeval buildings and 100s of tourist shops, bit like Mont St Michel really. But even in it's heyday that was the case. Our final night's stop was in St Saud-Lacoussiere, a tiny village between Nontron and Limoges. A wonderful hotel there called Hostellerie St Jacques (that pilgrim theme again!) If ever you are in the area go and stay there. The hotel is very French and the food is to die for. In the Logis de France hotel guide. I've been going there for 20+ years and it is never ever a disappointment. The final trip from there to Le Havre - all of 380miles - was done on Friday in heavy torrential rain all day. The vibration continued, but manageable and the autoroutes were generally pretty empty, which was a blessing given the wet weather. And the hood/car did not leak!!!!!!!! HOWEVER 20 miles from Le Havre the alternator packed up. We made it to the ferry queue (3hrs early), I put the battery on solar panel charge (it had stopped raining by then) and we went for some dinner. Returned to the car, started up and alternator back running, just. Moved towards the ferry and alternator came and went, as did the power to the ferry terminal as all their computers went down!! We eventually got on board, established the car-deck lights were left on all night, so put the charger on for the overnight crossing. I can only assume it got a dowsing in the heavy rain, died, dried out and started working again. It's still working a week later. But the vibration continues to be a mystery. I have had the wheels balanced and they are now OK. The tracking was done before I left, so that should be OK, so what is causing the vibration? I will check all the suspension bolts are still tight after changing the shocks before the holiday to eliminate that, but someone did suggest the suspension bushes may be worn. The CV joints are OK I think as there is no clicking at low speed full lock: it is definitely a speed related thing. Any ideas?? Overall a fantastic holiday, great driving in lovely hot weather with the hood down, 1838 miles covered at 31mpg, non stop food and drink and above all wonderful company with my lovely Grace.